Growing up in Sri Lanka, Hiran was always involved in making things—even helping his family with home repairs if necessary. Tinkering with design projects at such a young age led to excellent hand skills, creativity and problem solving abilities—a skill set he uses at Boundless every day. He particularly enjoys working on challenging orthotic designs. These include patients who have unique needs, or making improvements to previous designs so that they are stronger and more comfortable. In addition to the mechanical aspects of a device, he has to consider a person’s body, environmental demands and personal preferences. 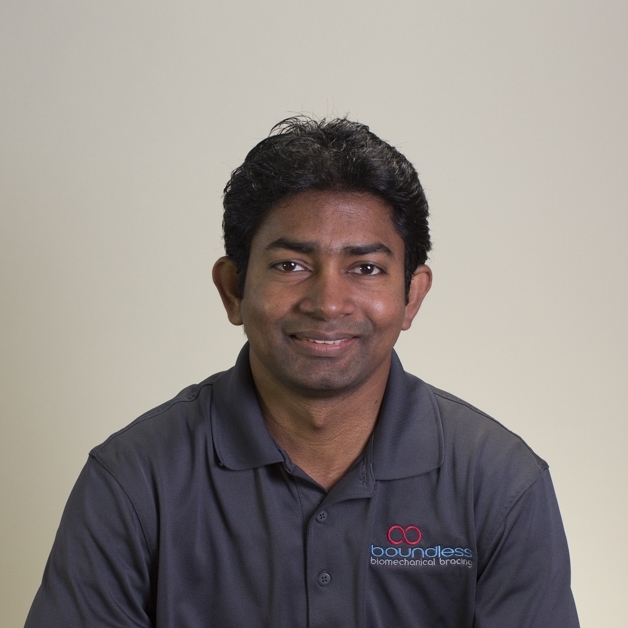 After Hiran takes the time to figure out a solution, it’s immensely gratifying when it works for both the patient and their family. Like everyone at Boundless, he is excited about innovations in materials, particularly new componentry and joints. Over the years, he has seen technicians take a more active role in decisions regarding material selection and design. Long term, he wants to provide expertise in this area that will lead to optimal orthotic performance. Hiran is a graduate of the Sri Lanka School of Prosthetics and Orthotics (SLSPO). Upon graduation in 2008, he worked at SLSPO and the Jakarta School of Prosthetics and Orthotics. He is now working toward his certification with the Canadian Board for Certification of Prosthetists and Orthotists.